The word based application forms (AF) have been replaced by electronic application forms (eAF), with new possibilities like electronic data import/export, data population within the form, online access to standardised catalogue terms, built in business rule validation, and support for validation of form, etc. Implementation of mandatory use of the eAF is part of the HMA eSubmission roadmap. The electronic forms and supporting technical documentation are available below. Previous news can be found here. 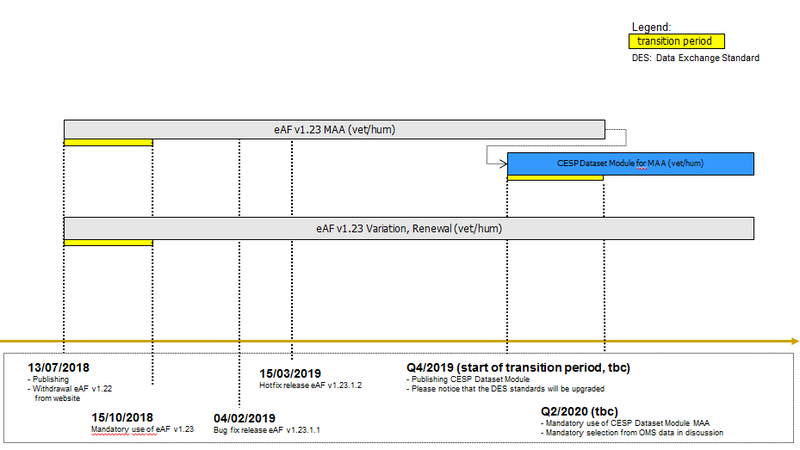 A webinar providing an update of the CESSP phase 1 project (converting the current eAFs into web based forms) will be held on 7 May 2019 from 10:00 to 11:30 CET. This webinar is aimed for applicants (from pharmaceutical industry). A separate session aimed for regulators will be be organised in near future. Please note that participation in this webinar is on first come first serve basis as the maximum capacity of the virtual meeting room is limited to 200 participants. If multiple users from your organisation are attending, please share the connection with your colleagues. The webinar will be recorded and the recording will be made available on the CESSP webpage after the webinar. Please join the webinar in the virtual meeting room on 7th of May at 10:00 CET: https://connect.ema.europa.eu/webinar/. How to login is availble here. The applicants are reminded that eAFs should be edited and signed using Adobe Reader. Using Adobe Acrobat Pro may lead to issues when the regulators review the applications using Adobe Reader and this may lead to validation issues and delays in processing the applications. More information can be found in the eAF Q&A document. The release notes for MAA Human and Veterinary electronic Application Forms (eAF) and the Renewal eAF have been updated to reflect new known issues. eAF dropdown lists not working? Users are reminded that the eAFs will need to be ‘trusted’ in order for the dropdown lists to work. To ‘trust’ the forms, please click the exclamation mark on the top of the left hand pane and select ‘options’ to open the trust options. Select ‘trust this document always’ to proceed. Version 1.23.1.2 of the 4 electronic Application Forms (eAF) is now available. This release v1.23.1.2 is an unplanned hotfix release to fix 3 issues that affected the functioning of the forms. More details on the fixes are available on the release notes. This hotfix release does not affect the Data Exchange Standard (DES). This new version (v1.23.1.2) of the forms will fully replace the versions 1.23.1.0 and 1.23.1.1 after transitional period, on 4 April 2019. The version of the form should not be changed during an ongoing procedure. Version 1.23.1.1 of the 4 electronic Application Forms (eAF) is now available. This release v1.23.1.1 is a bug fix release providing usability improvements and technical defect fixes. This bug fix release does not affect the Data Exchange Standard (DES). This new version (v1.23.1.1) of the forms will fully replace the version 1.23.1.0 after transitional period, on 4 April 2019. The version of the form should not be changed during an ongoing procedure. The eAF user guidance Q&A has been updated and can be found in the“Guidance documents / Q&A” section. Please note that applicants should use Adobe Reader or Adobe Reader DC for locking the forms. Adobe Acrobat or Acrobat Pro DC should not be used for filling and locking the forms as this may cause issues when the locked forms are opened/viewed by the recipient who may be using Adobe Reader/Adobe Reader DC. If you need to request a missing substance in order to complete an eAF, please submit a request for substance insertion with the corresponding SmPC to the EMA Service Desk portal. If you need to request a new term (e.g. pharmaceutical form or unit of measurement) or a request for an update of an already existing term in order to complete the eAF, please submit a request through the SPOR Portal - http://spor.ema.europa.eu/rmswi/#/ providing as much supporting documentation as possible (e.g. name of the product concerned, SmPC, etc.). Please note you need to be registered with SPOR prior to submission of change requests: https://register.ema.europa.eu/identityiq/login.jsf. The user guide for managing referential and organisation data in eAF is available here. The Data Exchange Standards and XML Schema Definitions published here are intended to allow software developers within other organisations to develop systems to process the electronic application form data and build equivalent systems, if required. The EMA will ensure that the latest versions of these documents are published here.